When angry protests erupted earlier this year on college campuses across the nation, many student activists issued a list of demands to their university administrators in an effort to call attention to the lack of diversity and inclusion at their institution. In a number of cases, college presidents—feeling pressure and wanting desperately to avoid the negative publicity that often accompanies student protests—relented to the students’ demands, offering all sorts of concessions in exchange for calm. In some cases, the promises included commitments to double their efforts to retain minority students and to triple the number of minorities—particularly Black faculty—hired in full-time, tenure-track teaching positions. Whether these institutions will ultimately make good on their many promises is yet to be seen. But what we do know is that, when administrators at predominantly White colleges and universities have historically been criticized for the miniscule number of Blacks on their faculties, their response has been that there are not enough qualified Ph.D.s. That kind of rhetoric has long angered diversity proponents who feel that many colleges and universities simply haven’t been aggressive enough in their efforts to diversify their applicant pool and respond to the growing concerns about climate issues on campus. Dr. Marybeth Gasman, a professor of higher education and director of the Center for Minority Serving Institutions at the University of Pennsylvania, recently penned a provocative essay in the Hechinger Report in which she offered a bold explanation for why colleges haven’t fared well when recruiting and hiring more faculty of color. Nearly five years ago, a group of Black doctoral students from various academic disciplines and fields did just that. Not wanting to wait for university officials to provide a solution, they began meeting informally and started talking about their experiences in the academy and their long-term plans of joining the professoriate. Out of those meetings, the Black Doctoral Network (BDN) was formed. It has since become a place for Black doctoral students and Black professors to network and talk about the intense pressures that they encounter on their campuses, while also gaining mentorship and support from colleagues, many of whom have navigated the process of tenure and promotion. While these kinds of associations for Black scholars are hardly new, BDN is the youngest, and perhaps the only one of its kind, to bring together individuals from across a diverse set of academic disciplines. Each year, BDN hosts a conference and draws hundreds of individuals from across the country. The conference provides participants with an opportunity to share their research and to interview for jobs or entry in competitive doctoral programs. More than 30 colleges and universities, including Auburn, Baylor, Columbia, Stanford, the University of Massachusetts Amherst and Michigan State University, participated in the graduate and career recruitment fair in Atlanta last month. Since its inception, many conference-goers have published together and have received valuable advice from some of the nation’s most visible Black academicians such as Drs. Julianne Malveaux, Cornel West, Tricia Rose, William Julius Wilson and Patricia Hill Collins, who have become ardent supporters of BDN. Malveaux, who spent five years as president of Bennett College, a historically Black college for women in Greensboro, North Carolina, argued that, if predominantly White institutions are serious about increasing the number of Black graduate students and Black faculty, they should become a member of BDN. The cost for colleges and universities to join the network is $750 a year and includes a direct opportunity for universities to locate and find emerging Black talent through BDN’s expansive database. In January, for example, BDN will host a faculty recruitment event in Philadelphia where colleges and universities will be able to interview prospective Black applicants on the job market. But beyond helping its members find a job, those who frequent the yearly conference and the other events hosted by BDN say that they appreciate the fellowship that is central to the organization’s mission. Unlike many other conferences, BDN provides a space for Black undergraduate students to present their research. Melissa James, an Africana studies senior at Rutgers University and a Ronald McNair Scholar, participated in a research poster competition. She says that her participation in the conference helped her to network and connect with others who’ve traveled along a similar path. That kind of focus on undergraduates is one of the values of the BDN, says Atiya S. Strothers, a doctoral student at Rutgers University. 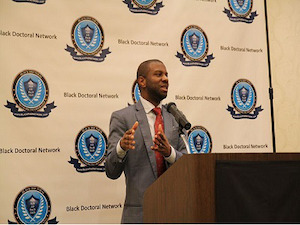 For more information about the Black Doctoral Network, visit www.blackphdnetwork.com. Jamal Eric Watson can be reached at jwatson1@diverseeducation.com.